The funny but helpless Geemies are relying on you – their survival is in your hands! Tap, swipe, pull, and flick to master this exciting easytouch, free arcade game. Make your unkilled mummy ball jump like spiderman and shuffle up, down, and sideways on crumbling pillars like surfers riding the tide to help King Phero save the Geemies! Based on simple physics, Bungee Mummy: Challenges is a great example of free arcade games that don’t need wifi. This easytouch and funny game takes you on a joyride exploring Egyptian legends in which you need to surf through dangerous areas, arena by arena, to survive. Engage your hopper hero in a fun run across various stages packed with endless pesky, fishy snakes and scorpions to kombat and smash, cramped cages to bungee blast through, arcane scarabs to be collected and crates to drop accurately into escaping carts. 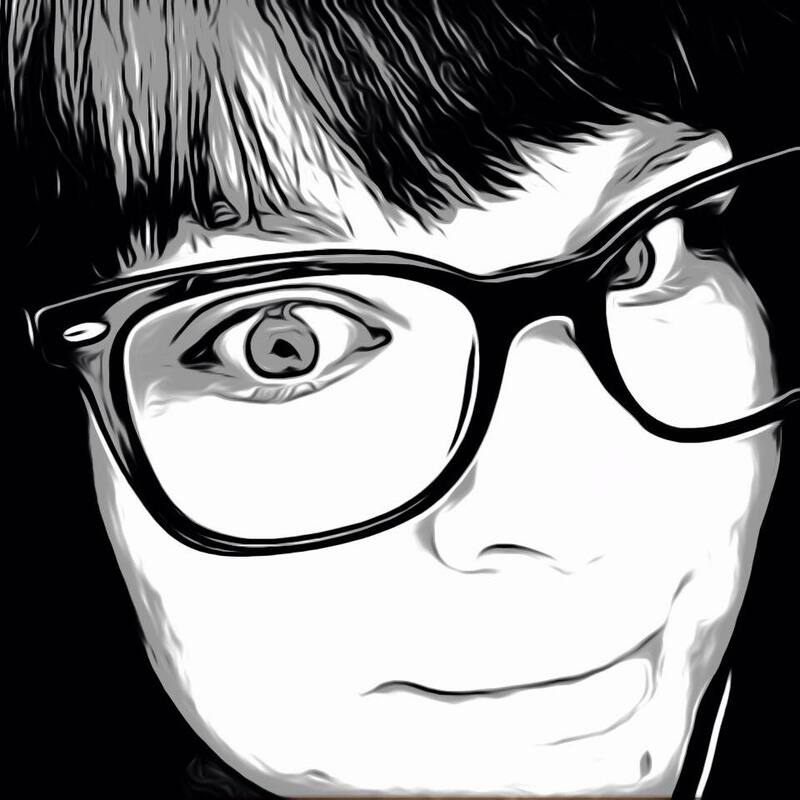 A task that may seem simple at first soon becomes a heart racing challenge that you will be super determined to overcome using your own wit, tactics, and gameplay style! Think you can outpower and outsmart the mortal competition? Challenge your friends with score duel on the global arena and conquer the leaderboard in each fanduel like a boss! Arcane legends are waiting for a new hero. Do you have the power and skills necessary to be crowned King? We will be granting you more super mini games with incredible Egyptian legends graphics and crossy challenges to dominate as we launch updates to Bungee Mummy: Challenges. 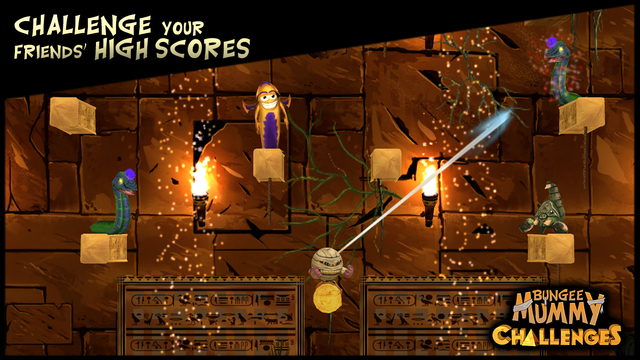 King Phero, the main character of Bungee Mummy: Challenges, looks to be an angry ball of bandages, but he is a feisty hero with the capabilities to solve all of the stages of this game. There are four demanding stages to master, each with their own difficulties. In Bungee Blast, tap and pull Phero to slingshot into the cages and free the Geemies. Snake Smash requires aiming skill to zap all of the snakes possible while the clock ticks down. Crate Escape is especially tricky as Phero must grab crates with his bandages and drop them in the carts below before time runs out. Wheel of Misfortune will make things dizzy as Phero swings from stone to stone on a never-ending turning wheel to collect as many scarabs as possible. 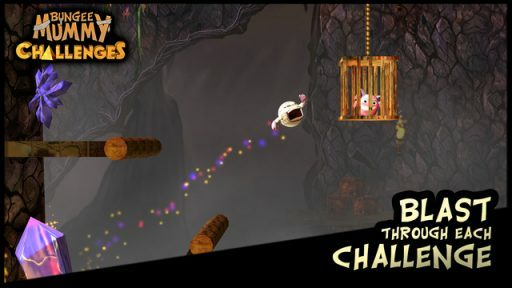 With mechanics that mimic a range of other apps from Angry Birds to Cut the Rope, Bungee Mummy: Challenges is an app with a variety of styles of gameplay to choose from for endless play. I really enjoyed the way the game is broken up with more than one way to play as it keeps it from being repetitive. When you get stuck trying to complete one stage you can always go to another for something different. The games are difficult, but not so much that you get discouraged. The controls work well for the most part though I think a little tweaking could be done in the Crate Escape where cutting the bandages didn’t always take the cut. The music definitely sets the tone with loud drumming that lends to the adventurous feel and keeps you playing with King Phero much longer than some other apps. Bungee Mummy: Challenges promises real mummy fun, delivers beyond what is expected and does so with absolutely no ads to be found. The app is available now for free in the App Store and Google Play store.